Night Of The Living Dead, 2001: A Space Odyssey, Once Upon A Time In The West, bean bag chairs, ziplock bags, Will Smith, Hugh Jackman and Gillian Anderson. On reflection, 1968 was a pretty good year. Intelligent, thought-provoking cinema, the birth of three (very different) era-defining actors and the creation of something to keep your sandwich in as you flopped down onto the latest in soft furnishings – all while listening to This Was, the debut album from a bluesy rock (if not for long) band called Jethro Tull. It’s debatable how Smith, Jackman and Anderson will be celebrating their respective 50th birthdays, but suffice to say there’ll be enough candles to constitute a pyre. For Ian Anderson and his band, though, it’s about moving forever forward, but with one eye on the past – and a very specific part of the past at that. Ian Anderson looks up from his coffee and makes some mental calculations, tapping out a rhythm on the table between us with his forefinger as the numbers add up. And what a remarkable decade that was. It saw a musical evolution that carried them from their bluesy debut through to the breakout Stand Up, the conceptual landmark piece Thick As A Brick, and took in two-thirds of their folk rock trilogy, Songs From The Wood and the inestimable Heavy Horses. Along the way, they reinvented prog rock, introduced folk rock to a truly international audience and kept in step with the times, all while fine-tuning the way they kept moving as a band. What a first 10 years. “I think that period is when most people would have come to Jethro Tull,” says Anderson, “Maybe it was ’69, maybe it was ’78 for some people, but it was in that era when they got to know about us. Even for much younger fans today, they will almost certainly gravitate to that era of music to check out what was happening when Tull was relatively shiny and new, even though we were in a period when we’d evolved so much, when prog rock was in its original incarnation when it was successful. You must remember, it was only four or five years before it became ridiculed. Ian Anderson, shot at home exclusively for Prog, January 2018. So did the band and bandleader feel in or out of step with the times? Part of Jethro Tull’s enduring appeal is that they always kept a wary eye on the world around them. Anderson was writing about the ecological impact on the world as far back as the 1970s, which would later mutate into something much more cohesive and pointed (and way ahead of the times) in the subject matter of the 1979 Stormwatch album. Anderson arches both eyebrows and smiles thinly. “I think I’m usually in keeping with the times, it’s just that my way of expressing that isn’t going to be a fashionable and glossy way of making it seem relevant today. “It’s something I felt pretty obvious about in the mid-70s – then there was no point in trying to follow fashion and reinvent myself, to be somehow in keeping with the next generation of music makers. I loved the music I loved: I wasn’t a fan of things like Elvis – I was too young – but then I got into the Howlin’ Wolf and grittier blues and wasn’t interested at all in what went before. I sneered at it. They weren’t my thing. Same thing with the early Beatles. He swirls the remnants of his coffee around in the base of his cup. We’ve been picking over the band’s expansive catalogue for the best part of two hours. No one is more invested or willing to pick over the bones of the band that’s been his life’s work. He talks about product, titling, how to present – and sell – his music. He’s an artist with an acute sense of business, which is yet another reason for his and Tull’s longevity. That and his acute eye for the times he and his band found themselves in. “It’s interesting that you mention Stormwatch,” says Anderson. “That album was very much about issues of conservation, climate change. You must also remember that the album came at a time when the scientific thinking of the day was that we were verging towards the likelihood of a mini ice age, so that was the driving force behind some of the songs on the album. Once the ice core samples started coming out in the 80s, the scientific community had to rethink this. “To go back to the first climate song I wrote, it was Skating Away On The Thin Ice Of The New Day. For the first time we were hearing about the distinct possibility that there could be man-made climate change and all of that tied in to population growth and all the other issues that have been exacerbated by pollution and so forth. “In some ways I feel okay about having touched on those topics back then. It didn’t make for a good or even acceptable song, but at least it’s not just repeating yourself in the same old way; at least you’re moving on, into topics that are a mixture of the contemporary while still paying attention to where we’ve come from. And back to Anderson’s musical evolution as an artist: was that him striving artistically or did he simply get bored with one form if he had to repeat it over and over again? “To be honest, in the case of the blues, I always felt a charlatan. Blues as an influence, it’s as important to me now as it ever was. It’s almost like a technical thing when you analyse the scales and the rhythms applied in that music. Lyrically, on the other hand, there’s almost nothing that has hung over in my life after the first Jethro Tull album, nothing from that world. “Musically, blues still has a part in what I do, but it’s just one of several influences and arguably maybe not as important compared to folk and classical music in the broadest sense. There are perhaps greater influences, but blues is still part of what I do and who I am. “Some of the things I was recording last March, at least one of them is rooted in a blues feel, so it’s still something that’s there for me today. There are certain passages, even on an album like Heavy Horses, that I will use and use again. Think of it like a chef in a kitchen with a spice rack. He’s probably got 30 things in there and he’s used them all before, but perhaps not in that order or with that twist, but there are lots of things you can do with that repertoire. And that applies to music too, you hope. Casting an eye over the Tull catalogue, does Anderson unearth many howlers? Are there moments when he does nothing but wince? Are there many musical missteps? The coffee’s finished, as has our interview, but there’s just time for one more reminiscence from a life spent living in and around music. It comes when Prog remarks that even into his 70s, Anderson still has the singing pipes of a man decades younger, which seems to surprise him. “I’ve never been a strong singer,” he says. “Comparing me to, say, Robert Plant is absurd – he has a God-given talent, which I recognised, fearfully, the first time I ever met him when Alexis Korner brought him into a club we were in. It might have been the Speakeasy, one of these awful places that your manager made you go to. Anderson pushes his coffee cup away. There’s more dry laughter as we both gather our bags and head for the door. The question of whether there will be another Jethro Tull album remains unresolved, even as Anderson readies himself to go back, once more, to living in the past, knowing that come what may, he’s happy to visit all his yesterdays while he’s still living for today. Jethro Tull’s 50th anniversary tour of the UK starts on April 3 in Manchester, and the USA tour starts on May 30 in Phoenix. 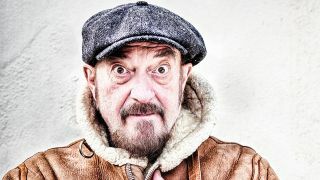 For a full list of dates and more information, see www.jethrotull.com.